The terraced seating area provides an open flexible space for reading or events. 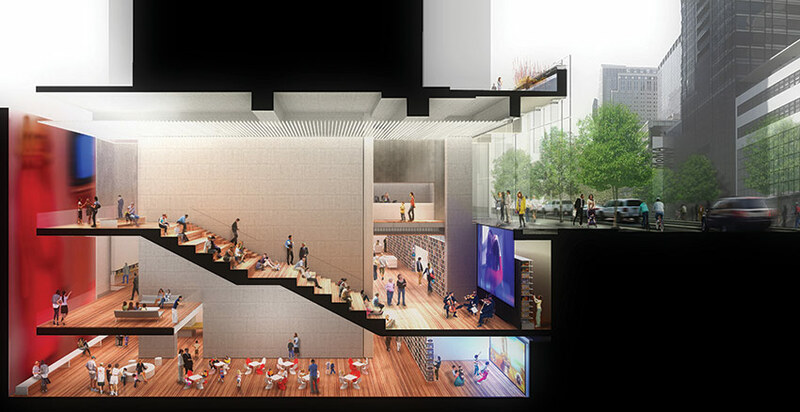 Only months after releasing Foster + Partner’s plans for the controversial renovation of its Main Branch on Fifth Avenue, the New York Public Library (NYPL) has unveiled TEN Arquitectos’ design for the 53rd Street Library, which will stand on the former site of the much beloved Donnell Library. In the last few years, scarce funding coupled with substantial operating costs has compelled the NYPL to rejigger its branches. In some cases, this has meant closing, downsizing, or merging locations. But beyond financial constraints, the Library faces a greater and even pricklier challenge that puts into question the role of the institution: how to best serve the public at a time when demands and needs are changing. In an attempt to function both as a traditional resource for scholarly endeavors as well as a venue for community events, the NYPL is trying to adapt and re-imagine the spaces these libraries inhabit. Section through the library staircase. It has been five years since the Donnell Library closed its doors. In 2008, NYPL sold the property to Orient Express Hotels, which had planned to build a hotel along with space for the new library, but then abandoned the project when the economic crisis hit. Now Tribeca Associates and Starwood Capital own the property and have committed to carving out room for the library at the base of a 50-story hotel and residential development. 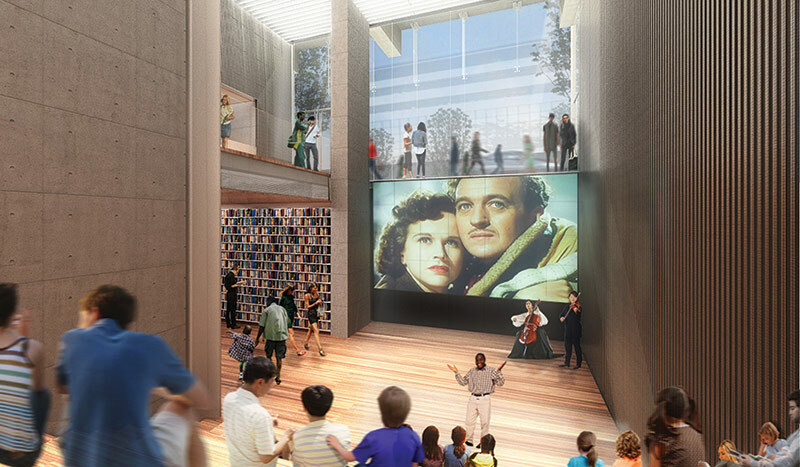 The new $20 million, 28,000-square-foot branch—a significantly smaller space than the original Donnell Library—will take up three levels, two of which will be underground, and house a number of flexible communal spaces, along with a children’s area, an auditorium, a computer lab, and an audio-video collection. The downsizing accounts for the reshuffling of several collections, such as the Centralized Children’s Room and the World Languages Collection, which were previously located at Donnell and have since been moved to other branches. “The librarians’ approach was to move some of the collections originally at the Donnell, which didn’t fit together in the first place, to locations which would be more convenient for the users of those collections,” said Dave Offensend, Chief Operating Officer of NYPL. 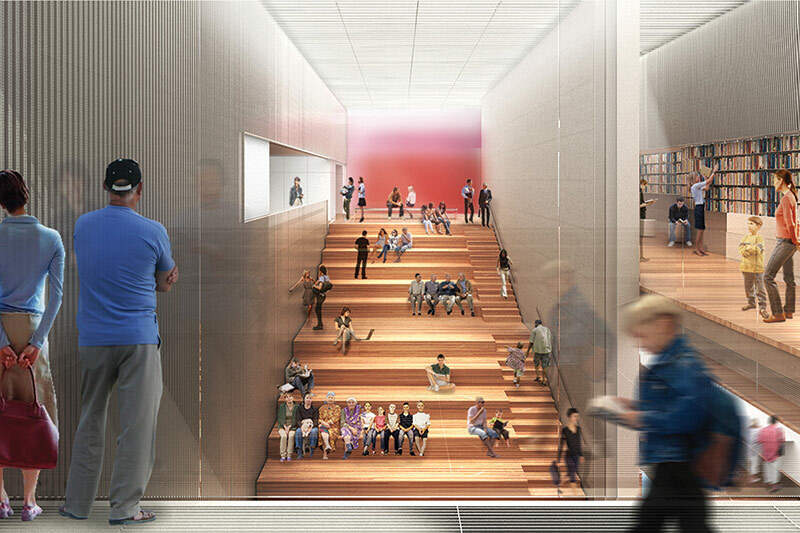 Library-goers can currently find the Media Collection at the Library for the Performing Arts and the World Languages at the Mid-Manhattan Library, which will eventually be merged with the flagship branch. 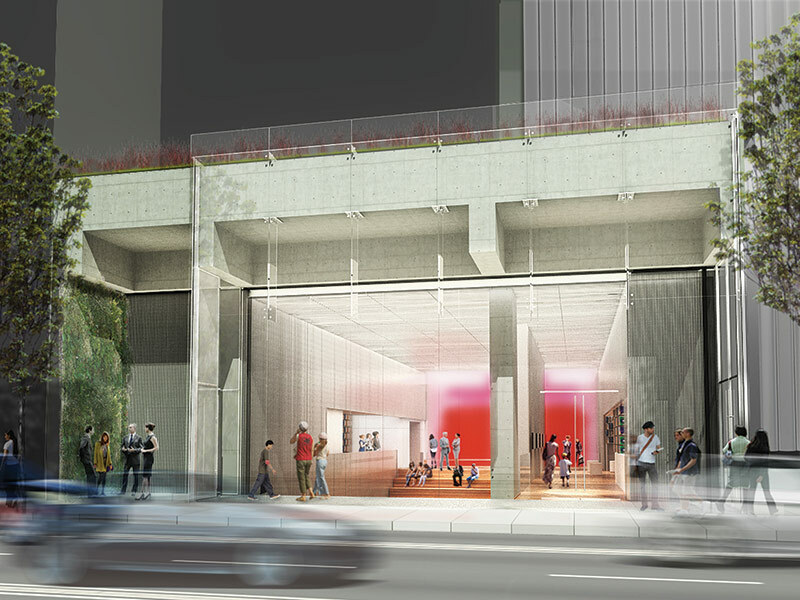 With most of the library located on subterranean levels, TEN Arquitectos set out to create what Steele describes as a “light and airy experience” that assuaged “everyone’s concern that their cultural institution had been relegated to a mall, and worse, a basement of a mall.” The firm accomplished this by creating a glass frontage through which light filters into an open terraced seating area that will be used for a variety of activities, such as special events, reading, or gathering.